The baritone ukulele has a beautiful, rich, deep sound. It introduces some classical guitar overtones which the traditional ukulele sound doesn’t have. There are two vital elements to creating its unique sound. 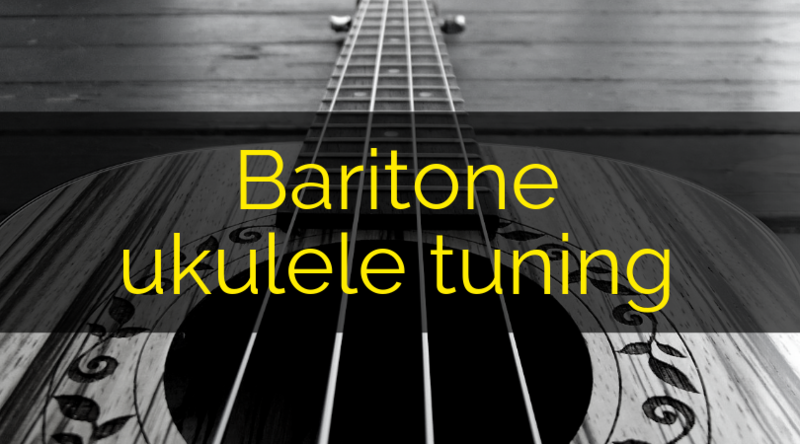 Firstly, baritone ukulele tuning is a 4th lower than standard soprano tuning. Secondly, standard baritone tuning uses linear rather than reentrant tuning. Both of these make the baritone unique in the world of ukuleles. Most courses, sheet music and online content use the G, C, E, A tuning. But this will not work for the baritone, as it has tuning notes of D, G, B and E. For any guitarists reading this, D, G, B and E should be familiar, as they are the top 4 strings on the guitar. This makes the baritone a great transition instrument for a guitarist. Due to the limited resources, the baritone can be tuned to the standard G, C, E, A tuning (assuming you are using the correct strings), which is found on the soprano, concert and tenor ukuleles. Alternatively, baritone tuning could be used with a capo at the 5th fret to achieve the same notes. However, rather than forcing a baritone to sound like the other common ukulele sizes, let’s celebrate its uniqueness. Standard tuning for the soprano, concert and tenor uses reentrant tuning. This is where the strings are not tuned high to low in order. The open G note of the 4th string is higher in pitch than both the 3rd and 2nd string, but one tone lower than the 1st string, providing part of the unique ukulele sound. The baritone is different; the tuning is linear. This is where the strings are tuned from high to low in order. The 4th string is the lowest pitched, followed by the 3rd, then 2nd, with the 1st string being the highest pitch. 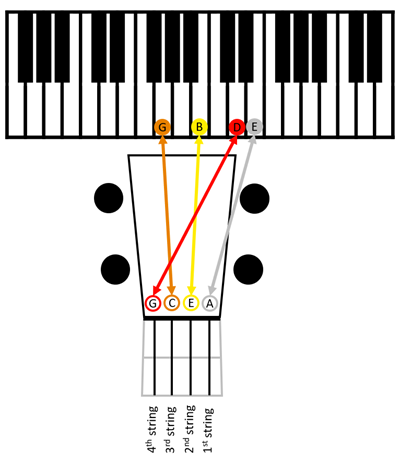 The image above shows the linear tuning notes in comparison to a piano keyboard. Alternative tunings on the baritone are used to re-instate reentrant tuning, which creates a more ukulele-esque tone. To achieve this, the 4th string is tuned an octave higher. Therefore the tuning notes become D4, G3, B3, E4. While not the same pitch as the other common ukulele types, it is the same musical intervals. 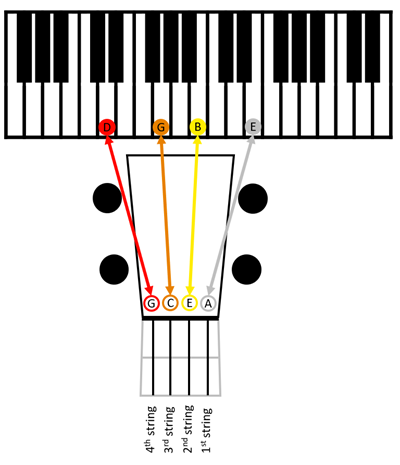 The image above shows the reentrant tuning notes in comparison to a piano keyboard. Ultimately, these two options this create High-D and Low-D variations similar to the High-G and Low-G found on the tenor ukulele. Whether you go for the High-D or Low-D variation, you will need specific strings. With linear tuning, the 4th string must be thicker to create the Low-D sound, while the 3rd, 2nd and 1st strings are identical. These are the strings I recommend for the Low-D and High-D. If you are playing with others, then you must be in tune with them, each string needs be tuned precisely. However, if you’re playing on your own, it’s OK for the instrument to be in tune with itself, even though it might not be at concert pitch. The easiest method to tune a ukulele is to use an electric tuner. As a baritone uses the same notes as a guitar, it is possible to use a guitar tuner, which are easier to find within music shops that ukulele tuners. If you are buying a specific ukulele tuner, make sure it can be used with a baritone ukulele. An electronic tuner is a good option for beginners; it will show the pitch and whether you are too flat or too sharp. Relative tuning is the process to tune a ukulele to itself. The following tuning method uses the 4th string as the starting pitch. If using the alternative High-D tuning, the following method should be followed. This also uses the 4th string as the starting pitch. Celebrate the uniqueness of the baritone ukulele. Its feel and tone cannot be replicated by other ukuleles, or any other instruments for that matter. While many have preferences one way or the other, I think the baritone ukulele tuning variations give more options to the player. So make the most of it, and have fun.